I have been having major make-up cravings lately! 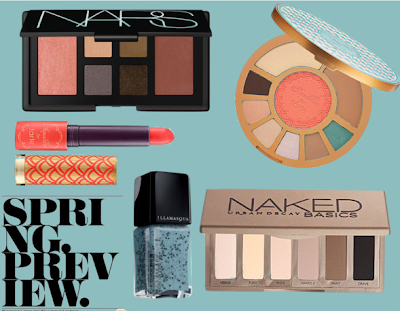 Here are some make-up products that currently are at the top of my beauty wishlist. 2. I am on the hunt for the perfect coral lipstick. This tarte lipstick from the Limited Edition Aqualillies collection may just be the perfect shade. Plus the packaging is gorgeous. 3. I have been searching for these Speckled polishes everywhere! I love the pastel colours with the multi-sized black glitters. Fragile, the baby-blue, looks just like a robin's egg. 4. Another great multitasking palette. This palette would be perfect for bringing to any of your spring or summer destinations. I love all the choices of colours! Great everyday colours along with a pop of aqua. And I love the coral & mint packaging. 5. A must-have product for so many people that I haven't yet made the leap to purchasing...yet. The third eyeshadow palette in the Urban Decay Naked line, Naked Basics, features 5 matte shades and one shimmer. Another travel-friendly palette. At first, I thought purchasing this would be overkill since I already have Naked 1 & 2, but.....a girl can never have too many eyeshadows. What are some of the make-up items on your wishlist? Definitely get the Naked Basics, it's my favorite! And the speckled nail polish is seriously so pretty, I would love to get my hands on it(: Great wishlist!